Although actually manufactured as an insulating fabric, the principle of using doubly-metallised polyester films as solar filter material was initially established by L. M. Dougherty’s paper describing its use as long ago as 1979 (Journal of the British Astronomical Association, 1979, vol 89, page 450). Since then, the technology has happily become more astronomically targeted and colour-shifted away from Mylar’s cool blue. 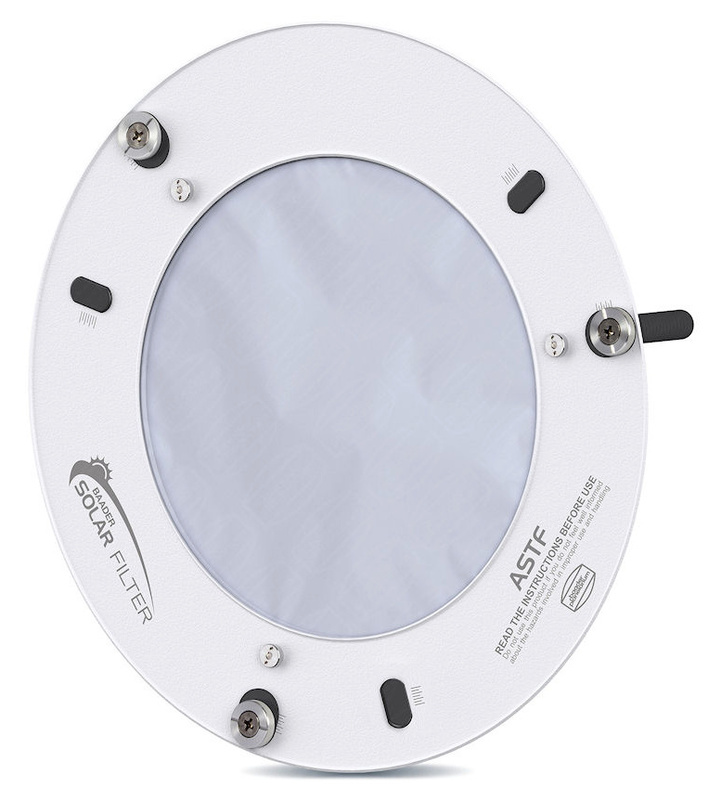 This new range of solar filter employs Baader’s renowned Astrosolar safety film (ND 5.0), placing this into a robust and easy-fitting mount that comes in a range of apertures from 80mm to 280mm diameter. The resulting solar disc is revealed in a neutral white, with a lack of limb ‘bleed’ that provides a clean sharp descent into a black sky at the Sun’s edge. The neutral band pass allows you to decide on subsequent filtration, rather than having (for instance) a sunset glow permanently imposed on you by the solar filter itself. Each kit contains filter material that is held firmly (but not tightly!) within a ring that holds the safety film in a temperature-compensated frame that ensures there are no undue stresses imparted to the fabric. Such stresses would impair the optical properties needed for best results. The frame is fitted with three clamping bolts that provide fine adjustment for secure attachment to a telescope’s aperture. As an added measure, three Velcro straps act as backup to ensure that the filter does not move during observation or imaging. 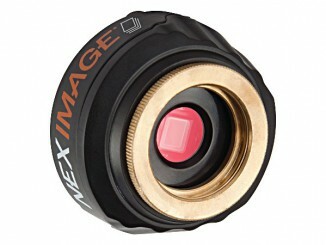 Price: £50 to £119, depending on aperture. An international research team has used sophisticated computer simulations to calculate a two-dimensional map of the dust chemistry in the solar nebula, the thin dusty disc that surrounded the young Sun and out of which the planets formed. 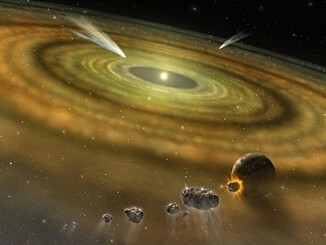 The study has given new insights into the chemical composition of the dust grains that formed in the solar system 4.5 billion years ago. The total solar eclipse of Wednesday, 9 March 2016 is of relatively long duration — 4m 9s at greatest eclipse — which occurs at 1:57 UT. 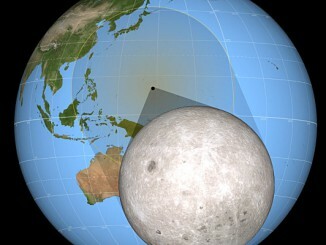 Totality is visible from Sumatra, Borneo, Sulawesi and the North Pacific Ocean, while the partial phases can be seen from East Asia, Australia and the Pacific Ocean. See the event unfold in these new NASA timelapse visualisations. Looking for a high-resolution, high-speed camera for imaging Saturn at opposition with your telescope? Steve Ringwood appraises the one-shot colour Celestron NexImage Burst, capable of capturing 120 frames/second — and it comes with image-processing software too!